TALEGATOR Truck Accessories introduces a new state of the art kit to open and close tailgates on all trucks using the latest remote control technology. 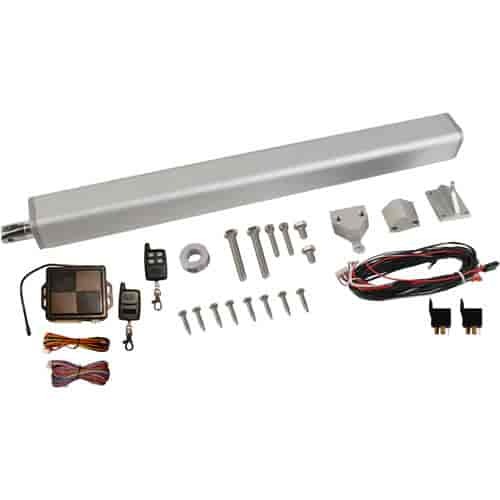 Providing additional security and value to any truck, this easy to install Universal Power Tailgate Lift Kit (Part Number TG-1) opens and closes your tailgate by simply pressing a button on the remote. Installation is designed for the do-it-yourselfer and comes with tough universal brackets and a heavy duty screw-type Linear Actuator that provides up to 250 pound lifting capacity for the heaviest of tailgates. Electrical hookup has never been easier, with a Keyless Entry Module and a Plug and Play Harness. This reliable system will out perform a hydraulic system without all the complicated plumbing and upkeep. Everything is included in the kit including Control Module, Plug and Play Harness along with mounting brackets and hardware plus easy to understand instructions. Electric Life ''state of the art'' Talegator Kits open and close tailgates on all trucks using the latest remote control technology. Providing additional security and value to any truck, these easy to install Universal Power Tailgate Lift Kits open and close your tailgate by simply pressing a button on the remote. Installation is designed for the do-it-yourselfer and comes with tough universal brackets and a heavy duty ''screw-type'' Linear Actuator that provides up to 250 pound lifting capacity for the heaviest of tailgates. Electrical hookup has never been easier, with a Keyless Entry Module and a Plug and Play Harness. This reliable system will out perform a hydraulic system without all the complicated plumbing and upkeep. Everything is included in the kit including Control Module, Plug and Play Harness along with mounting brackets and hardware plus easy to understand instructions. Rugged Anodized Aluminum Linear Actuator with 200LB. Lifting Capacity. Mounting Brackets Are Supplied with a High Quality Black Powder Coat Finish, Extremely Weather Resistant. All Stainless Steel Mounting Hardware. Modular Control System Allows For Easy Integration With Power Door Locks. Quick Release Pins Allow for Fast And Simple Removal Of The Linear Actuator In Case of Power Failure. A Perfect Solution For Trucks With Shaved Handles. TG-1 is rated 3.0 out of 5 by 1.